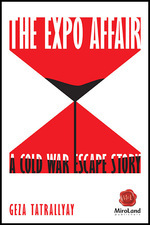 Canadian author Geza Tatrallyay will read from his memoir, The Expo Affair, the second book in his Cold War Escape series, published by Guernica Editions under its MiroLand Imprint. This is a narrative memoir of international intrigue and romance that took place in the exotic setting of Expo ’70 in Osaka, Japan. As a host at the Ontario Pavilion, the author, Geza Tatrallyay, was approached by three Czechoslovak hostesses who wanted to defect to Canada. What follows are his efforts to make their wish come true. Notables such as former Prime Minister Trudeau, External Affairs Minister Mitchell Sharp and General George Kitching play a role, as do individuals who have since become prominent in Canada as businessmen, artists and ambassadors..
For the Children, the first book in the series is the story of his own escape from Hungary during the Revolution in 1956 and subsequent immigration to Canada. This was published last year, as was his collection of poetry, Cello’s Tears. Six months earlier, Twisted Reasons, the first book in a trilogy of thrillers was published by Aylmer-based Deux Voiliers Publishing. Geza has another thriller to be released later this year, as well as a second collection of poetry. Geza was born in Hungary, and after immigrating to Canada, grew up in Toronto. He studied at Harvard University, taking a year off to work at Expo’70 in Japan. After Harvard, a Rhodes Scholarship took him to Oxford University and the London School of Economics and Politics. In 1976, Geza was a member of the Canadian Olympic as a fencer, where he helped a Romanian-Hungarian fencer defect to Canada, which forms the subject of the work-in-progress third memoir in the Cold War Escape series. His career has spanned government, international organizations, corporate and investment banking, venture capital and environmental finance. Geza has lived in many different places, including Ottawa, Toronto, Montreal, Boston, New York, London, Budapest, Vienna, Bordeaux and Montevideo and currently resides in Barnard, Vermont. Geza is married, has two children, and a grandson and another one on the way. For more about Geza Tatrallyay, visit his website at www.gezatatrallyay.com. The author Geza Tatrallyay received an excellent review on Readers’ Favorite, and got 5 stars! For the Children: A Cold War Escape Story by Geza Tatrallyay is a suspenseful biography of the author’s family’s escape or odyssey first to Austria and then to Canada from Hungary, in the crucial year of 1956. For the Children is a rich book of historical facts of the dangers that a family during those troubled times underwent just to escape from a claustrophobic political and social environment…all for the love of their children. Tatrallyay’s mother and father wanted a better life for their three children and so decided to leave their native land of Hungary, which was so dear to them, to travel to a foreign land to start afresh. For the Children is a biography of courage, determination and tenacity even during the most awful situations. It is one of the best books of a grand escape during the Cold War years that I have ever read. Tatrallyay also weaves into his narrative a bit of history of the political situation of that era, which makes it more informative. I highly recommend For the Children to all students of history and political science who are studying the times and conditions of the lives of everyday citizens in Europe after the Second World War. Tatrallyay’s book is engaging and impressive, I simply could not put it down. The narrative is gripping. The characters are the cornerstones of this biography. Their courage and willpower, especially that of Tatrallyay’s mother, are extraordinary and out of this world. The descriptions are graphic and the book is a real page turner. It tends to seep under your skin and suddenly you feel that you are the one trying to escape the tyranny of a communist power, which looms in the background of the biography like a cobra. Tatrallyay is an intellectual writer and meticulous in his work. It is remarkable to me to believe what he had to go through at the age of seven to get out of his own homeland alive. This biography is a must-read.